Washington • National Security Agency leaker Edward Snowden, believed to be in legal limbo in the Moscow airport, is expanding his requests for asylum to another 19 countries, including China, according to WikiLeaks. WikiLeaks, the anti-secrecy group that has adopted Snowden and his cause, on Monday night posted a statement said to be from Snowden that slammed President Barack Obama for "using citizenship as a weapon." "Although I am convicted of nothing, it has unilaterally revoked my passport, leaving me a stateless person," Snowden says in the statement. "Without any judicial order, the administration now seeks to stop me exercising a basic right. A right that belongs to everybody. The right to seek asylum. "Their purpose is to frighten, not me, but those who would come after me." WikiLeaks legal adviser Sarah Harrison delivered the requests for asylum to an official at the Russian consulate at the Moscow airport on Sunday, according to the website. WikiLeaks says some of the requests have already been delivered to the appropriate embassies. The WikiLeaks statement said requests were made to China, Cuba, Nicaragua, Venezuela, India and several European countries. 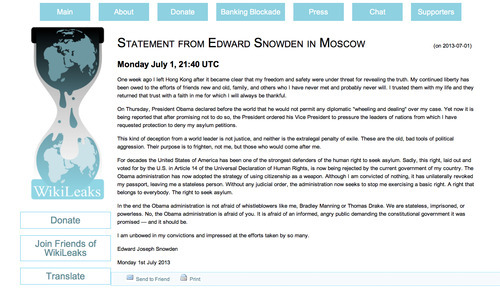 Snowden had planned earlier to seek asylum in Ecuador and has requested asylum in Russia. The asylum requests reported by WikiLeaks and the Snowden statement could not be independently authenticated. Snowden, who has been on the run since releasing sensitive NSA documents, is believed to have been in Moscow airport&apos;s transit zone since his arrival from Hong Kong on June 23. The U.S. has annulled his passport, and Ecuador, where he had hoped to get asylum, has been giving mixed signals about offering him shelter. After Snowden applied for political asylum to remain in Russia, Russian President Vladimir Putin told reporters in Moscow that Snowden would have to stop leaking U.S. secrets if he wanted asylum there  and he added that Snowden seemed unwilling to stop publishing leaks of classified material. At the same time, Putin said he had no plans to turn over Snowden to the United States. The expanded requests for asylum come as the Obama administration contends with European allies angry about the release of documents that alleged U.S. eavesdropping on European Union diplomats. Obama, in an African news conference with Tanzanian President Jakaya Kikwete, said the U.S. would provide allies with information about new reports that the NSA had bugged EU offices in Washington, New York and Brussels. But he also suggested such activity by governments would hardly be unusual. "We should stipulate that every intelligence service not just ours, but every European intelligence service, every Asian intelligence service, wherever there&apos;s an intelligence service  here&apos;s one thing that they&apos;re going to be doing: They&apos;re going to be trying to understand the world better, and what&apos;s going on in world capitals around the world," he said. "If that weren&apos;t the case, then there&apos;d be no use for an intelligence service." The latest issue concerns allegations, published in the German newsweekly Der Spiegel, of U.S. spying on European officials. French President Francois Hollande demanded Monday that the U.S. immediately stop any such eavesdropping and suggested the widening controversy could jeopardize next week&apos;s opening of trans-Atlantic trade talks between the United States and Europe. "We cannot accept this kind of behavior from partners and allies," Hollande said on French television. German government spokesman Steffen Seibert told reporters in Berlin, "Eavesdropping on friends is unacceptable." He declared, "We&apos;re not in the Cold War anymore." Even before the latest disclosures, talks at the upcoming free-trade sessions were expected to be fragile, with disagreements surfacing over which items should be covered in or excluded from an agreement. The United States has said there should be no exceptions. But France has called for exempting certain cultural products, and other Europeans do not appear eager to give up longtime agricultural subsidies. Obama said the Europeans "are some of the closest allies that we have in the world." But he added: "I guarantee you that in European capitals, there are people who are interested in, if not what I had for breakfast, at least what my talking points might be should I end up meeting with their leaders. That&apos;s how intelligence services operate." Nonetheless, Obama said he&apos;d told his advisers to "evaluate everything that&apos;s being claimed" and promised to share the results with allies. Meanwhile, the Interfax news agency said a Russian consular official has confirmed that Snowden had asked for asylum in Russia. Interfax cited Kim Shevchenko, the duty officer at the Russian Foreign Ministry&apos;s consular office in Moscow&apos;s Sheremetyevo airport, as saying that Snowden&apos;s representative, Harrison, handed over his request Sunday. "If he wants to go somewhere and there are those who would take him, he is welcome to do so," Putin said. "If he wants to stay here, there is one condition: He must stop his activities aimed at inflicting damage on our American partners, no matter how strange it may sound coming from my lips." Obama said "there have been high-level discussions with the Russians" about Snowden&apos;s situation. "We don&apos;t have an extradition treaty with Russia. On the other hand, you know, Mr. Snowden, we understand, has traveled there without a valid passport, without legal papers. And you know we are hopeful that the Russian government makes decisions based on the normal procedures regarding international travel and the normal procedures regarding international travel and the normal interactions that law enforcement has. So I can confirm that." Putin didn&apos;t mention any Snowden effort to seek asylum in Russia, and spokesman Dmitry Peskov declined to say what the Russian response might be. Putin insisted that Snowden wasn&apos;t a Russian agent and that Russian security agencies hadn&apos;t contacted him. Three U.S. officials, speaking on condition of anonymity because they weren&apos;t authorized to publicly discuss the Snowden case, said Washington&apos;s efforts were focused primarily on persuading Russia to deport Snowden either directly to the United States or to a third country, possibly in eastern Europe, that would then hand him over to U.S. authorities. In a sign of the distrust generated by the Der Spiegel report, the German government said it had launched a review of its secure government communications network and the EU&apos;s executive, the European Commission, ordered "a comprehensive ad hoc security sweep." U.S. Secretary of State John Kerry said Monday he didn&apos;t know the details of the allegations, but he still played them down, maintaining that many nations undertake various activities to protect their national interests. Kerry failed to quell the outrage from allies, including France, Germany and Italy. A spokesman for Herman Van Rompuy, the president of the European Council, said, "The European Union has demanded and expects full and urgent clarification by the U.S. regarding the allegations." According to Der Spiegel&apos;s report, which it said was partly based on information leaked by Snowden, NSA planted bugs in the EU&apos;s diplomatic offices in Washington and infiltrated the building&apos;s computer network. Similar measures were taken at the EU&apos;s mission to the United Nations in New York, the magazine said. It also reported that the NSA used secure facilities at NATO headquarters in Brussels to dial into telephone maintenance systems that would have allowed it to intercept senior officials&apos; calls and Internet traffic at a key EU office nearby. 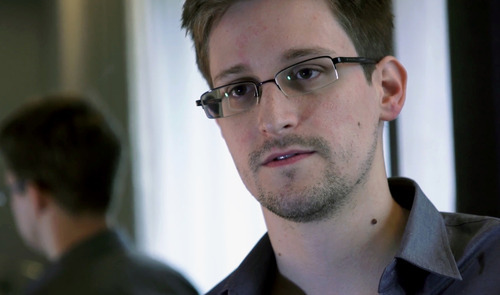 As for Snowden, White House national security spokeswoman Caitlin Hayden said the White House won&apos;t comment on specific asylum requests but reiterated its message to all countries that he "needs to be expelled back to the U.S. based on the fact that he doesn&apos;t have travel documents and the charges pending against him." Regarding possible effects on U.S. interactions with Russia, she said it remains the case "that we don&apos;t want this issue to negatively impact the bilateral relationship." A letter identified as being from NSA leaker Edward Snowden is slamming President Barack Obama for "using citizenship as a weapon. The letter, posted Monday on the Wikileaks website, could not be independently authenticated as being from Snowden himself. Wikileaks is the anti-secrecy group that has adopted Snowden and his cause. The statement with Snowden&apos;s name at the bottom said the Obama administration quote  "has unilaterally revoked my passport, leaving me a stateless person." Snowden, who has been on the run since releasing sensitive NSA documents, is believed to have been in Moscow airport&apos;s transit zone since his arrival from Hong Kong on June 23. The U.S. has annulled his passport, and Ecuador, where he has hoped to get asylum, has been giving mixed signals about offering him shelter.